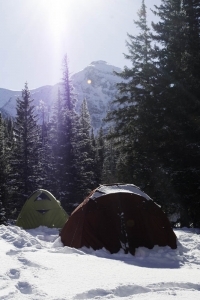 GLacier Adventure Guides offers customized multi-day winter camping in Glacier National Park. Whatever your means of travel, be it cross-country ski or snowshoe, we’ll get you away from civilization and deep into a winter paradise. Campers will sleep in a tent during travel days, and will build igloos or quinzees when we arrive at our campsite. After establishing camp we’ll head out on day tours of the area. Your guides handle all transportation, meals and navigation. Winter camping in Glacier National Park is the ultimate way to experience the desolate frozen beauty of the Park in the off-season! Another sunny, snowy morning at camp. Our guides are experienced in winter travel and camping techniques, with certifications in Mountain Travel & Rescue and Avalanche training through National Ski Patrol. We are certified in Wilderness First Aid and are well-versed with cold-related injuries. Guides will prepare all of your meals, with primarily organic, locally-sourced food. We prioritize your safety and comfort during these extended winter tours. Day 0: Meet at the Glacier Adventure Guides office in the evening for trip briefing and equipment check. We like to get the technical details handled early for a smooth start the next day. Day 1: Meet at the office at 9 a.m. and load up gear. Drive to trailhead and begin the trip! Travel to campsite where we will pitch tents or create snow shelters, maybe do a short tour, have dinner, and settle in for the evening. OVERNIGHT: Up at first light for breakfast, followed by morning tour of the area. We will then pack up and head back to the trailhead. MULTI-DAY: Up at first light, breakfast, and we will either break camp to move, or if we’ve reached our destination, prepare for a full day of touring the area. Final day will follow the overnight itinerary. Note: Many of these articles are mandatory for your safety in this occasionally harsh environment. Insulated vest: down or synthetic. Gloves: a pair of heavy gloves, a pair of medium weight gloves, and thin gloves for handling cold objects in camp. Down jacket: can also be synthetic, must be well-insulated! Balaclava: for sleeping and colder-than-average days. Note: some areas may be unavailable due to poor conditions, closures and/or dangerous weather. Lake McDonald, placid and serene on a winter afternoon. An ideal outing for those new to winter camping. We begin near Apgar, where we will snowshoe or ski two miles into camp. After establishing camp, we have the option to make day trips on the McDonald Trail, Rocky Creek Trail or ski the Camas Road to McGhee Meadows. This is a great tour for the whole family and a very easy way to break in to the realm of winter camping. The view into Snyder Basin from Lake McDonald. Our most popular winter camping destination, Snyder Basin, sits a mile high on the west side of Glacier. Guests will travel four and a half miles in to the basin, which is home to Upper and Lower Snyder Lakes. There we will camp at the foot of the lower lake, either pitching tents or digging in for the night. Views from camp abound, the most prominent of which is the magnificent west face of Mt. Edwards. From camp, we have the option of touring the frozen waterfalls of the upper basin or hiking up to Mt. Brown Fire Lookout. The short travel time and remote feel continue to make this trip a guest favorite. Get deep into winter on a trip to Avalanche Lake. One of the Park’s most traveled summer trails, Avalanche Lake sees virtually no one in the winter months. Guests will trek or ski six miles on the Sun Road to Avalanche Campground, where we will establish base camp. From there we strike out on day trips down the Sun Road or up to Avalanche Lake. Views of the Avalanche Basin are spellbinding, as well as the icy gorge and snow-covered cedars. For the relative ease of approach and camping, this winter camping tour is one of our most rewarding. Sunset on the gentle slopes of Firebrand Pass. The scoured, rolling terrain of Firebrand Pass makes this a premier overnight for snowshoers and cross country skiers. The wind-swept heights of the pass see more sun and wind than anywhere nearby. Views of the massive front range are big and varied on this tour. Guests will travel anywhere from 3-7 miles (5-11 km) to the first campsite. Days will vary between day tours and traveling along the Rocky Mountain Front.The nature of this area lends itself well to amazing through routes, which can be arranged based on your group’s skill and fitness. Many miles of spectacular wilderness await those fit and motivated enough. 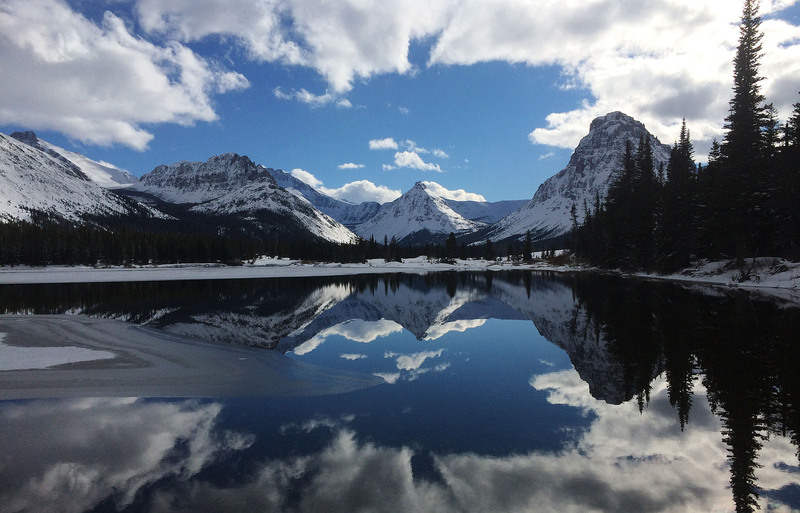 A truly adventurous endeavor- winter camping at the foot of Upper Two Medicine Lake. This is one of our wildest and most spectacular destinations, tucked ten miles back from a desolate highway. Views of Rising Wolf Mountain and Scenic Point dominate the campsite. Guests will take one or two days to make it to base camp, where we will have bathroom facilities and access to water. Day tours from camp will lead guests by stunning mountain lakes and peaks frozen in winter’s grip. Our “Two Med” expedition is rewarding, challenging and should not be missed. Considered a remote destination in the summer, Many Glacier becomes an incredible voyage in the heart of winter. The journey down Lake Sherburne leads travelers to the Many Glacier Hotel, whose off-season aura lent inspiration to the hotel in the film “The Shining”. After a 12-mile journey to Swiftcurrent Lake, we will establish base camp. From there we will tour to Iceberg Lake, Grinnell Lake and Bullhead Lake. This is our most intrepid adventure and also the most rewarding. Missoula International Airport (MSO): 2-3 hrs. Ready to book? You have the option to either call and book via phone at 877-735-9514, or email us with your inquiry. •	OFFERED: DEC. - APR.